This product is no longer available and has been replaced by: CR3000. Some accessories, replacement parts, or services may still be available. 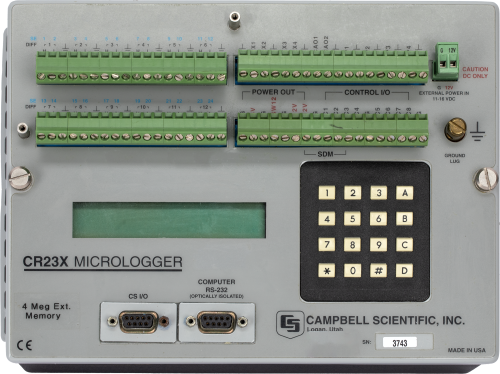 The CR23X Micrologger® was a portable, self-contained package that could store over 1,000,000 data points. It consisted of measurement and control electronics, communication ports, keyboard, 2-line alphanumeric display, power supply, and a battery-backed clock. The CR23X measured most sensor types directly, communicated via modems, reduced data, controlled external devices, and stored both data and programs in either non-volatile Flash memory or battery-backed SRAM. -NOTE- Note: Additional specifications are listed in the CR23X Specifications Sheet. Execution of this download installs the CR23X Operating System (Mixed-Array) on your computer. Execution of this download installs the CR23X PakBus Operating System on your computer. Can a CR23X program be sent to a CR3000? No. The CR23X program must be translated into CRBasic using the Translator software or by hand. What might cause a CR23X to lock up and display an "E08 Watchdog Reset" error? E08 errors are occasionally created by voltage surges or transient voltages. Section 3.9 of the CR23X manual explains in greater detail what a watchdog is and possible causes. If these are happening frequently, it is likely an issue with the system that needs to be resolved. 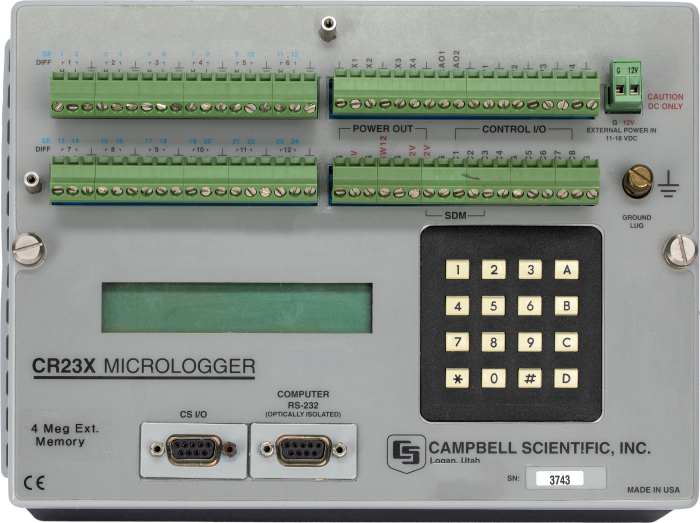 The first step in this resolution process would be to check the system power (inputs and outputs) and verify it is within the expected tolerances as outlined in the Specifications page (OV-23) of the CR23X Micrologger Operator's Manual.